I'd take and show a few pictures of the unboxing and describe the initial impressions, build quality and materials, general design, size-weight and portability. Brief description of of what hi-Res audio certification and IP rating mean, as well as any other feature or design choice that not the main obvious characteristics described on the first few lines of the amazon listing. I will compare the sound with another highly popular portable speaker and give my thoughts about it and finally list my most and least favorite characteristics and impressions. 5 solid full frame DSLR quality pictures top otherwise it gets messy. I have had only positive experiences so far with Anker and I trust the brand but in any case, although I'm no audiophile, this'd be an honest review so don't chose me if you don't trust your product! I would compare it to a few other speakers I have such as the flare, motion Q, Polk Audio Speakers, and my Sony speakers. I would do a loudness test using my meter to gauge how loud it is at certain distances and also a range test to see how far away from the source it can play. My 18th month wants to call santa via Google Assistant, fingers crossed this is loud and clear enough to keep her attention..
That is awesome! 3 winners is great and all part of this community, even better! Good Luck y’all!!! How to write your test plan: 1). Explain the features you want to test 2). Explain how you’ll conduct the tests 3). Think of ways to be creative and make your review stand out. 4) Include your country of residence so we know you’re from an eligible country. 1: I'll review contents/accessories, sound quality and volume, battery life at different volume settings, and also a water test. I would first do an unboxing of the product and include initial thoughts. I would test the loudness of it and test the bass. I would listen to all different types of genres of music at varying volume and some videos to test it's all around sound quality. Also, I would test it in different settings. For example, high ceilings, low ceilings and outside. I would test the maximum distance it can be connected to by blue tooth and also test out the water-resistance of the speaker. I would also want to test out how long the Model Zero takes to charge and how long it can play music on one charge. I would be reviewing this speaker in the US and would share it on Youtube, Twitter, Facebook, and Reddit. I would last give my final impression and go over my likes and dislikes. I would also post a follow-up video about 3 months after, explaining how I have been using it in everyday life and do a slight review of the Model Zero after 3 months. Hi. I'd love to give this product a professional and in-depth review. My method of review would be a YouTube Video uploaded in 1080p to my channel, which will be filmed on a Sony PXW-160. First Look - overview of the box, the pricing, the listed specifications and some beauty-shots. Unboxing - a gradual unboxing of the product, detailing the items included, and a initial impression of the weighting and feel. Power on - first time device activation, demonstrating how the device operates when first powered on. Connection/Pairing - a real-time demonstration of pairing the speaker with my phone (OnePlus 6T). This will show how easy/fast the speaker pairs with a phone. Sound - my first impression of the sound, detailing the bass response, as well as the mids and highs, giving a general assessment to how the speaker sounds. Seven days later - I believe speakers can sound better after a 'burn in' period, meaning I will play music through them for several hours over seven days, to see if the sound quality improves and to what degree. Closing Statements - an overview of my initial opinion of the speaker, going over how it sounds, how it is to use and the my general thoughts on it. Technical data - I have access to a semi-anachoic chamber and high-end audio monitoring equipment, so I will measure a frequency-response graph for viewers who may be interested in this. That would conclude my review. This would be uploaded to YouTube, as well as featuring a disclaimer of being provided a free product for review, although noting that this had not affected my opinion of the product, resulting in a fair, unbiased and honest review. Please find below a screenshot of my social media share. Please do not copy other's testing plan, otherwise you will be less qualified for this testing program. We understand and truly appreciate your guys' kind suggestion, which is helping the community to generate more positive content. We're trying to treat every participant fair, since this one is mostly taking the testing plan into consideration. Thanks for this latest testing event! I am a professional photographer based in New York City, USA with a large following on social media. I've also been a pro club DJ for 20+ years and have done High Fidelity & video installations. I am also a computer system builder. As a thorough reviewer, I depend on reviews for my own purchases and I hope that people will find my contributions helpful in their own purchasing decisions. 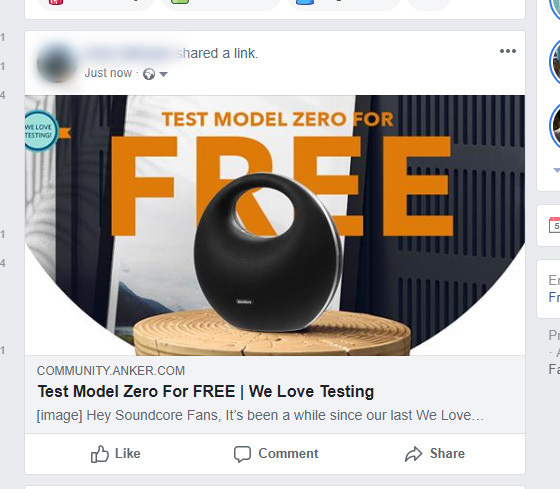 I'm interested in testing & reviewing the Model Zero. I would take professional product photos of the unit before testing to show the detail and quality of Anker's craftsmanship via lifestyle photos in my home, either at my computer workstation and/or in the living room. With that in mind, I'd test the sound with different applications & genres with an Android smartphone and Apple iPad. I hope @AnkerOfficial considers me in this round and good luck to all! I would then test ease of use and how to control everything including the bass up feature. 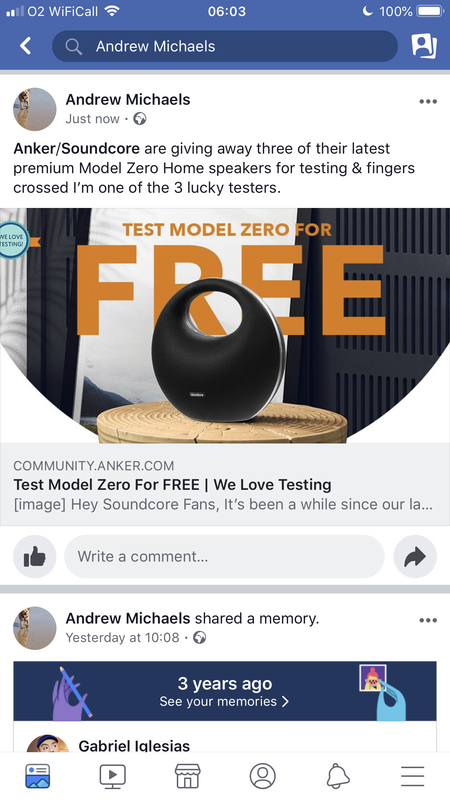 Fingers crossed that I am one of the lucky 3 to review this Model Zero - My previous reviews have had friends asking me about different Anker SoundCore Products. @AnkerOfficial can I still try to test this, even though my father put in to test it too? 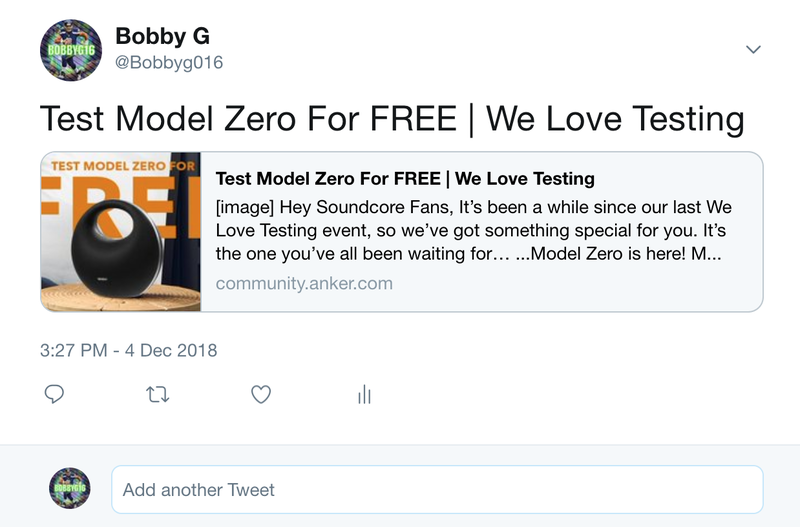 I would love to test Soundcore Zero. Compare with my Soundcore Flare on the exterior and sound. Connect it to my TV using bluetooth and test sound for both music, TV and films. Connect it to my mobile using bluetooth to test the range and sound qulity also any latency.